I saw this idea five years ago from Martha Stewart. I didn't have a groom but I knew that my wedding invitations would absolutely have to have a vintage stamps. Before we were engaged, I said that we had to get vintage stamps for the invitations. My fiance understood. Well, sort of. I refuse to use regular stamps. I am actually the person that stands in line to order pretty stamps, even for my bills. Call me crazy, but it adds a little sunshine to my day. Um, well, a lot of procrastination later and we are down to the 11th hour. The stamps needed to be ordered yesterday. Luckily, one of the Wedding Bees posted about Champion Stamp. My poor fiance and I have spent hours pouring over vintage and current stamps to find the absolute best montage. Here is what we found. Please give me your opinions on the best collection. I really would appreciate it! 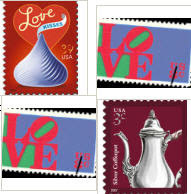 Love Kisses stamp. Very cute so we thought it was a possibility. Robert Indiana stamp. Statue is in the garden of the Indy art museum. Before we started dating, I always love it. option 1. not in love with the love stamp for some reason.